This Wednesday, Sept 20, 2017, image released by the Colorado Springs Police Department shows a van dash camera showing a raccoon on a windshield. Officer Chris Frabbiele was responding to an accident scene in a van used by police to investigate crashes when the raccoon landed on it late Wednesday night. Police spokesman Lt. Howard Black says the raccoon hopped off the van after Frabbiele stopped it. A Colorado Springs police officer heading to an accident scene in a van got a big surprise when a raccoon jumped onto the front windshield of the vehicle and stayed there until the officer pulled over. The Denver Post reports that officer Chris Frabbiele was responding to an accident scene in a large van used by police to investigate crashes when the raccoon landed on its windshield late Wednesday night. Police spokesman Lt. Howard Black says the raccoon hopped off the van after Frabbiele pulled over and stopped it. 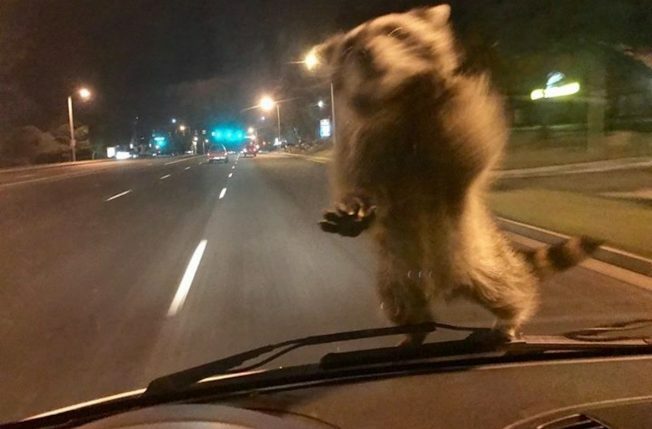 Images of the raccoon encounter from a van dash camera showed the animal appearing to cling to the windshield after it landed and crouching by the van's windshield wipers.